A filmmaker preoccupied with similarities and paradoxes, Krzysztof Kieslowski’s own career seems to have slowly inverted over the years from one centered on political realities to one of effervescent abstraction. Upon closer examination, however, both ends of his career focus on human individuals struggling to reconcile daily life with its cultural myths—be they Communist propaganda, Biblical proverbs, or French revolutionary slogans. If the people and characters of his films are rarely explicitly aware of their ideological projects, the viewers often are, through Kieslowski’s considerable filmmaking savvy and marketing conceits. A powerful storyteller, Kieslowski undermined the ordered world of his documentary descriptions and high-concept anthologies with the complex, often disillusioning lives of his central protagonists—a dialectical portrait of life oscillating between pessimistic deconstruction and an affection for human resilience. A non-committed student, Kieslowski simply wanted to begin a career. His father persuaded him to enrol in the local firemen’s college during his teenage years—a trick of reverse psychology which exposed him to a difficult profession and successfully ignited his desire for an education. Kieslowski’s father finally succumbed to illness and died at the age of 47. A distant uncle directed the College for Theatre Technicians in Warsaw, so Kieslowski enrolled. He subsequently fell in love with the theatre and decided to become a director, but in order to enter the program, first had to complete studies in another field. He chose film directing because he thought it would be related to the theatre, but failed his entrance exams to Lódz Film School two successive years in a row. During this time, he starved himself and faked psychological instability to avoid military service, which reminded him of the regimented life of the firemen’s college. He supported his family through various jobs, from office positions to theatrical tailoring (where he met many actors who would later work for him), and dabbled in poetry and drawing. After his third annual attempt, Kieslowski was finally admitted to the school. Lódz had been one of the few Polish towns spared from bombardment during the war. The film school was founded in 1948 for Stalinist propaganda, but it had developed a reputation for its liberal curriculum, which included rare screenings of international cinema and courses in film theory, as well as the production of fiction and documentary films. The school launched the careers of such filmmakers as Andrzej Munk, Andrzej Wajda, Roman Polanski, Krzyzstof Zanussi, and Jerzy Skolimowski. After writing a thesis entitled “Reality and the Documentary Film” which proposed that reality was stranger—and much more dramatic—than fiction, he graduated in 1968, during a time of heated political dissent and resistance. Internal rivalries within the Party prompted an ideological clampdown on cultural events and the resulting student demonstrations, violently repressed, were blamed on Zionist instigators. Many Jews were expelled from Poland, including members of the intelligentsia and even some of the faculty at Lódz Film School. After a brief stint making commercials for a cooperative in Warsaw and two state-commissioned films for the WFD, Kieslowski made I Was a Soldier (1970) for the Czolowka film studio, which specialized in documentaries about the army. He interviewed soldiers who lost their sight during the war and asked them to describe their dreams. In 1970, shipyard strikes broke out over the increasing cost of living and low wages, which prompted more public violence. Kieslowski has described Workers ’71: Nothing About Us Without Us (1971) as his most political film because it interviewed workers from around the country regarding their hopes and desires and exposed “the ruling class” as being decidedly unhappy with the current state of affairs. Unfortunately, the censors demanded extensive cuts and the film was never released. First Love (1974) depicted seven months in the life of a married couple, from four months into the wife’s pregnancy to two months after the child’s birth. Kieslowski orchestrated some of the situations—all of them intended as events which would otherwise naturally occur in daily life—in order to capture the participant’s unscripted responses. Originally envisioned as a documentary that would follow the newborn throughout her life until she also gave birth, Kieslowski actually negotiated with Polish Television and managed to convince the authorities to secure the couple a new four-room apartment in order to portray an “optimistic” view of family life. Kieslowski’s transition from a documentarist to a feature filmmaker was not immediate. As early as 1973, he had made his first professional dramatic film, Pedestrian Subway, a 30-minute television movie about a late-night romantic reunion. His last documentary (not counting the 18-minute segment for 1990’s City Life) was Railway Station in 1980, a portrait of the various people waiting for someone or something in Warsaw’s Central Railway Station. Throughout this period, Kieslowski had become increasingly concerned with the invasive role of the documentary and began to recognize its limitations in relation to the privacy and freedom of the individual. His raw footage for Railway Station was seized by police hoping for evidence which might have incriminated a murder suspect. Although it ultimately didn’t prove useful to the authorities, the idea that his work could be used to inform on fellow citizens sealed his decision to abandon the genre altogether. Pedestrian Subway was allotted ten days of shooting, but on the ninth night, Kieslowski re-envisioned the entire film and reshot it from scratch, filming improvisationally with a documentary camera without sound until morning. His predilection for restructuring films at the last moment—later to emerge through the numerous working versions of his late films he would create during the editing stages—revealed Kieslowski’s intuitive and flexible approach to filmmaking as well as his intense work ethic. The film is also noteworthy as being one of the first films shot by cinematographer Slawomir Idziak, the man behind the expressionist images of Kieslowski’s subsequent A Short Film About Killing (1988), The Double Life of Véronique (1991), and Blue (1993). In 1975 Kieslowski created his first feature-length fictional work, Personnel, a film about a theatrical troupe that he largely conceived as a tribute to his experiences at the College for Theatre Technicians. Shot in a hand-held, documentary style with a professional and nonprofessional cast, the semi-autobiographical film is notable for its convincing recreation of the chaos of backstage life and it culminates with the sort of ethical decision-making Kieslowski’s work would increasingly focus upon. A young tailor named Romek (Juliusz Machulski) with idealized notions of the theatre must come to terms with the business and politics of art when the opera director asks him to denounce a fellow worker on paper. The film implies that Romek refuses, but ends enigmatically before he leaves the office. 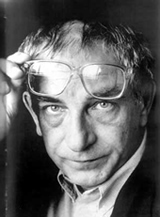 Kieslowski found himself socializing with a different group of peers once he started making fictional features, which included Wajda, Zanussi, Agnieszka Holland, and others, loosely comprising the Cinema of Moral Anxiety (roughly 1975–1981), a term invented by filmmaker Janusz Kijowski to denote films which critiqued social realities. 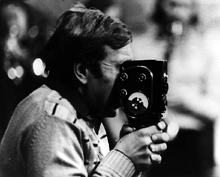 Camera Buff (1979) garnered Kieslowski’s first Eastern international acclaim by winning the Grand Prix at the Moscow International Film Festival. Stylistically, the film builds intensity through Jerzy Stuhr’s nuanced lead performance and the representation of Poland’s amateur film culture as a reflection of larger socio-economic issues. Factory worker Filip Mosz (Stuhr) purchases an 8mm camera in order to record images of his newborn daughter but his company Director (Stefan Czyzewski) places him in charge of making propaganda films for the factory. The assignment thrusts Mosz into learning the craft of filmmaking and he finds himself obsessed with it, starting a film club in an unused cellar (and inviting Zanussi himself as guest of honor), assembling a team of assistants, sending his work to a local amateur festival, and securing a contract with television. What lifts the film above a routine rags-to-riches story are two significant conflicts: his wife’s disenchantment with his newfound passion, and the censorial powers enforced by the Director (a character Kieslowski takes some pains to humanize). The conflict between Mosz’s career aspirations and his family life are keenly wrought and the artistic freedom he seeks is constantly restrained by politics, culminating in the success of a televised social portrait he makes being used against a factory acquaintance. Like Personnel, the film ends with an ethical quandry and like Railway Station, it’s a familiar one: should Mosz continue to present truth even if it inadvertently implicates other lives? Exposing his latest film to sunlight, Mosz slowly turns his camera towards himself—an image of increased interiority that suggests Kieslowski’s personal answer to the question in the latter part of his career. By 1980, Polish Solidarity had reached its zenith of popularity and political acceptance. Even members of the Communist Party were joining its ranks while the governing structure that remained allowed free trade unions and the right to strike, increased civil rights, and freedom of information. 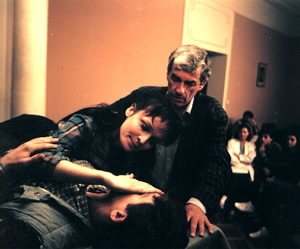 Kieslowski completed Blind Chance in 1981 and depicted three possible outcomes in the life of Witek (Boguslaw Linda), a young medical student hoping to catch a train to Warsaw after the death of his father: 1) he catches the train and becomes a Party member, 2) he misses the train, collides with a police officer, and ends up doing community service and falling into the underground Solidarity movement, 3) he misses the train and the officer, marries another medical student, and remains apolitical. The options clearly entailed the plight of Poland in general, but instead of supporting one future or another with ideological weight, Kieslowski suggested social realities were dependent merely upon the winds of serendipity. 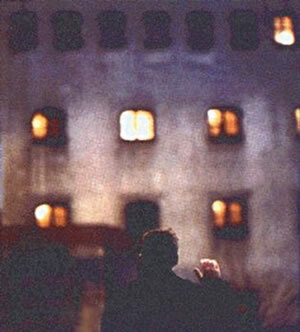 “It’s a description of the powers which meddle with our fate,” Kieslowski stated, “which pushes us one way or another.” (9) The dramatic emphasis becomes a matter of the personal choices Witek makes in order to preserve his essential nature within each political reality, and the alternate realities on view lend a detached, metaphysical perspective to the storytelling. However transitory the realities in Blind Chance are, they are vividly rendered. The film is more aesthetically rich than Kieslowski’s previous features—virtuoso tracking shots, striking images of violence, careful compositions and camera movements which blur the line between subjective and objective points of view, and an emphasis on private moments of observation (the staging of one scene allows Witek to wander around a bathroom gazing at random objects while offscreen sound propels the narrative). In December of 1981, the Communist authorities declared martial law in Poland. Solidarity was suspended and many arrests were made. Many filmmakers and artists were summoned by the police to sign statements of Party loyalty and most film production other than State-owned television ground to a halt. Kieslowski attempted to become a taxi driver to generate some income, but found he didn’t qualify. 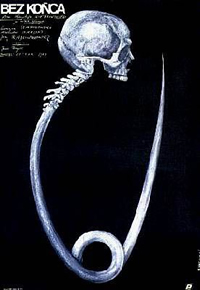 Kieslowski’s mother tragically died in a car accident earlier that year, and although he was slow to resume production, his next film would be No End (1985), a movie in which death plays a major role. While gathering material for a documentary on court sentencing during martial law, Kieslowski met Krzysztof Piesiewicz, a working lawyer who provided him with a first-hand knowledge of the daily dramas unfolding within the courts. (“I quickly realized that although I knew the atmosphere and knew a little about all this, I didn’t know nearly enough about what was going on in the wings, or the real reasons why people behave the way they do, about real conflicts,” Kieslowski explained, “And so I took myself along to see Piesiewicz and proposed that we write the script together.”) (10) Moreover, Piesiewicz would remain Kieslowski’s writing partner for the remainder of his career. If the narrative structure of Blind Chance encourages a metaphysical reading, the actual plot of No End fully embraces it. The film begins with a recently deceased lawyer, Antek (Jerzy Radziwilowicz), narrating to the camera while “inhabiting” his old home. 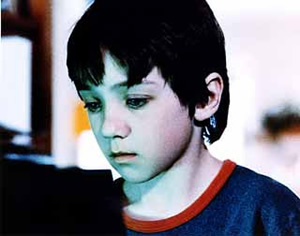 Throughout the film, it is implied that he affects the living world in small ways, but the family dog alone seems to be aware of his presence. One of his clients, Derek (Artur Barcis), is in prison awaiting sentencing on political charges and the main thrust of the narrative is how various characters relate to his case. Antek’s widow, Urszula (Grazyna Szapolowska, who would star in Decalogue: Two and A Short Film About Love), tries to overcome her grief and do what she can to help Derek’s wife; Derek’s new lawyer, Labrador (Aleksander Bardini, who would become a regular Kieslowski character actor), is a pragmatic and retiring public defender who pleads with Derek to compromise his ideals in order to escape heavy sentencing. Derek becomes the ethical focal point of the film, whose situation prompts the choices the other characters make. “After 45 years at the bar,” Labrador states, “he makes me ask myself: whom do we really defend? Against whom? Against what?” Kieslowski’s technique is more restrained than before, but his characters are more fully rounded and his handling of actors increasingly sensitive. Many scenes emphasize Urszula’s quiet moments of reflection and odd visual details—a close-up of a clenching hand or Urszula’s absent-minded rubbing of her toes—illustrates Kieslowski’s growing command of interior representation. The disquieting ending is a mixture of romantic longing and selfish resignation as Urszula decides to commit suicide (leaving her young son in the care of a grandmother he doesn’t particular like) in order to join her husband in the afterlife. The final, bittersweet image depicts the two of them walking together through an indigo twilight. As martial law gradually relaxed throughout Poland, leaving an economically and ideologically destitute population, Kieslowski’s films turned increasingly less politically representative. He once stated “it doesn’t matter whether you live in a Communist country or a prosperous capitalistic one, as far as such questions are concerned, questions like, What is the true meaning of life? Why get up in the morning?” (11) His next collaboration with Piesiewicz was the ten-part loose examination of the ethical underpinnings of the Ten Commandments, simply entitled The Decalogue (1988). 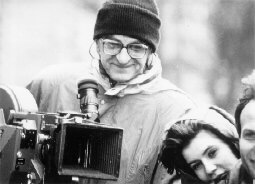 Initially made for Polish television with the idea of selecting ten different filmmakers to direct each one-hour episode—two of them to be expanded into theatrical features—Kieslowski and Piesiewicz began to “suspect intuitively that Decalogue could be marketed abroad.” Indeed, the series, which Kieslowski ultimately directed with nine different cinematographers, became a critical sensation on the festival circuit and served as the West’s first major exposure to his work. The Decalogue films are noted for their tight dramatic constructions, vividly rendered characters, and emotionally resonant ethical dilemmas depicting characters attempting to live in the modern world according to (or in search of) presupposed ideals. Although Biblical in theme, the series’ only explicit foray into theological meaning occurs in Decalogue: One, with its heart-rending story of a father dependent upon rationality and technology who is devastated by his son’s illogical death. In a striking image, the father (played by Henryk Baranowski) knocks over an altar in grief, causing a candle to drip down the face a Virgin Mary icon like paraffin tears—an enigmatic and yet wholly appropriate beginning to a series confronting the harsh realities of daily life in dialectical relationship to its metaphysical values. Kieslowski chose Decalogue: Five and the Ministry of Arts and Culture (who funded the series) chose Decalogue: Six as the two episodes to be expanded into features entitled, respectively, A Short Film About Killing and A Short Film About Love. (Decalogue: Nine was briefly considered to be expanded into A Short Film About Jealousy, but Kieslowski was ultimately too exhausted to do so.) (13) Although A Short Film About Killing differs only slightly overall from Decalogue: Five (both are remarkably powerful works about murder and the death penalty), the expansion of A Short Film About Love entailed a significant restructuring due to actress Szapolowska’s suggestion that Piesiewicz and Kieslowski strengthen the narrative content for theatrical viewers. While Decalogue: Six suggests a “slice of life” portrait without a clear dramatic arc, A Short Film About Love employs a more conventional narrative with stronger characterizations and emotional satisfaction, largely due to a framing device which places the story within a context of potential emotional healing. By 1989, Gorbachev’s perestroika had mustered its way into Polish life and semi-free elections enabled Solidarity to rise from the ashes and secure a majority of seats in Parliament. As Danusia Stok writes, “Poland was free for the first time since the Second World War. There was no longer any political censorship. But there was an even deeper economic crisis.” (14) The democratization of Poland produced no overnight miracles and serious systemic problems remained. So far removed from political realities is Double Life that the only hint of the social chaos raging in Poland serves as the backdrop for a chance meeting between Weronika and Véronique (both played by Irène Jacob) in the streets of Warsaw. Véronique, happily taking pictures of a political demonstration from inside a tour bus, doesn’t even notice Weronika standing mystified at the sight of her spiritual double, and the tightness of the framing and dramatic cutting between the two women as the bus drives away reduces the surrounding tumult to atmosphere. In fact, Double Life is, in many ways, a passionate celebration of intuitive thinking in and of itself and the interconnectivity of emotions generated by music, performance, and beautiful cinematography. A glittering tone poem with a careful arrangement of narrative patterns and details that remain remote, it’s certainly Kieslowski’s most abstracted and poetic film. Whether or not it offers any deeper meaning beyond its own amber-hued surfaces probably depends more on one’s interior predilections and aesthetic convictions than any explicit content on Kieslowski’s part. Kieslowski’s last three films, presented as a loose trilogy based on the colors and corresponding ideals of the French flag are resolutely interpreted within the framework of the interior life (Blue: freedom, White: equality, Red: fraternity). In many ways, the series is an artful summation of his career: an emphasis on the individual’s life and his or her relationship to an ideal, a nuanced and even playful approach to narrative, the paradoxes of chance and fate, the interconnectiveness of lives, and a central importance given to art and performance (both public and private). Although Red (1994) initially received the most acclaim of the three films, Blue is a magnificent achievement that has steadily developed its share of vocal proponents over the years. The subject of Blue is every bit as metaphysical as Double Life, but it is rooted in a more accessible narrative concerning Julie (Juliet Binoche), who survives an automobile accident in which her husband, a famous composer, and their daughter are killed. The film details Julie’s subsequent desire to free herself of all emotional attachments and manages to clarify her perspective with a vivid representation of interior life. Flashes of creative reveries coincide with screen fades and bursts of suppressed music, stylised subjective shots (sunlight traversing a Paris cafe table, the world reflected through a spoon, the gradual absorption of coffee through a sugar cube) include the viewer in Julie’s private world. Through Kieslowski’s subtle plotting, however, like tentative roots from a sapling, Julie slowly reconnects to life through a developing compassion for others and her growing artistic compulsions. It’s a graceful evocation of the inescapable force of love and art upon the soul and the paradoxical joys to be found in sacrifice, boundaries, and emotional commitment. White is a return to the dark humor and irony reminiscent of Decalogue: Ten with its story of Karol (Zbigniew Zamachowski), an impotent Polish man whose French wife, Dominique (Julie Delphy), divorces him. This sets in motion Karol’s elaborate plot to regain equality in their relationship, though the scheme he hatches verges on revenge and thus ensures a tragic combination of love and separation. (Quoting a Polish proverb, Kieslowski remarked, “There are those who are equal and those who are more equal,” suggesting equality is a fleeting and imperfect ideal.) (17) However, the film suffers in comparison to Blue and Red—the cool machinations of its protagonist (as well as its storytelling) often seem manipulative and superficial, but Kieslowski’s pessimistic wit shines throughout. In contrast, a large aspect of the beauty of Red is its generosity of spirit and apparent self-critique of Kieslowski’s own temperament and preoccupations. A genuinely kind and hopeful model, Valentine (Irène Jacob), accidentally injures the dog of a disillusioned, retired judge named Joseph (Jean-Louis Trintignant) who sits in his Geneva home and coolly monitors the telephone conversations of his neighbors. 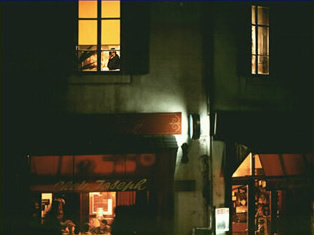 The clash of worldviews between the two characters—illustrated through a series of sensitively wrought conversations which begin confrontationally and end compassionately—illustrate a potent dialectic between cynicism and idealism, the rational deconstruction of Kieslowski’s films versus the uplift of his late sensitive humanism. The film delights in a labyrinth of double lives and chance occurrences which threads a connective line between Joseph and a younger law student, whose tragic romantic life simultaneously mirror’s Joseph’s past and projects Valentine’s possible future. After Kieslowski completed Red, he announced his retirement at the age of 52. He was exhausted from having completed the trilogy in a staggered, accelerated time frame (at one point, he was editing Blue, shooting White, and writing Red concurrently) and claimed frustration at the film medium for its inability to portray the inner life. (“Literature can achieve this, cinema can’t,” he said, “It’s not intelligent enough. Consequently, it’s not equivocal enough. Yet, at the same time, while being too explicit, it’s also too equivocal.”) (18) Claiming to be content with doing nothing, yet continuing to lecture and beginning to write a new trilogy of films with Piesiewicz (Tom Tykwer filmed the first of these, Heaven, released in 2002), Kieslowski died unexpectedly after bypass surgery in a Warsaw hospital. It was a sudden and tragic event, yet one fraught with the sort of coincidence and mystery Kieslowski himself may have appreciated. A thriving fan site with a list of resources, articles, papers, and a chat board. The official Decalogue site from Facets Multimedia. Includes photos, reviews, cast and crew information, press information and interviews. An informative all-region DVD comparison/review site with several Kieslowski titles. Derek Malcom’s Kieslowski entry for his 100 greatest movies. A photographic exhibition by Piotr Jaxa. Doug Cummings is a graphic artist in Los Angeles. He received a BA in Media Arts from the University of Arizona, moderates www.filmjourney.org and is a co-founder of www.mastersofcinema.org.